The weather is transitioning all over the world and often in a very volatile state. I haven’t broken out the gloves just yet, but I am ready to go whenever the time may come. Over the weekend I was able to catch up with a few friends—finally making time for those awaited long-distance phone calls and Skype sessions all filled with loads of joy and laughter throughout every conversation. It’s funny how swift a few hours can go by when you’re in good company, and fond memories are shared. It’s even better when there are reenactments of facial expressions to go along with those great tales of nostalgia. This was a comfortable outfit that I wore to meet up with a family friend to help her with fabric shopping, as she’s preparing to make her son’s Halloween costume. And, since leather already has an edge to it and naturally exudes a tough aesthetic, I decided to play with the idea of adding artistic and softer elements. 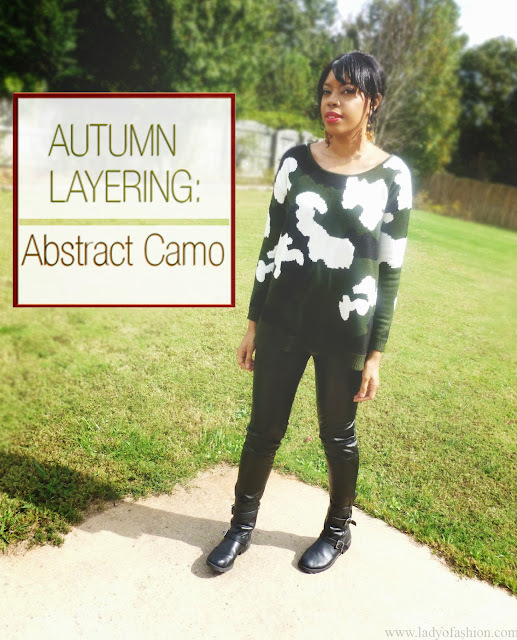 The addition of camouflage came to mind when I wanted to wear my lace skirt, so I took my abstract knit top and layered it with my leather trousers for a different look. Typically you see camouflage in the traditional motif, but I was really fond of this abstract knit version. It also reminded me of a globs of ink and puzzle pieces … only colour blocked in army-like hues. The goods: Biker boots-Dirty Laundry, Panel jacket w/ detachable zippers and Camouflage jumper-c/o Oasap, Patent clutch-Vintage, Lace skirt-Love Culture, Beaded necklace-gifted, Scarf-Ladyofashion design, Assorted bangles-Nordstroms, Burlington Coat Factory, Consignment. Killer jacket! I love that insect wing design. So freakin' cool! Thanks for leaving such a sweet comment on my blog, by the way! Much appreciated! Now that I've found you, I can keep up with you on Bloglovin'. :D I look forward to reading more of your posts! I think that this is one of the coolest camou prints I've seen so far!! I love that sweater! Oh my, love it :D Leather and white ruffles look great together and so does this certain camo pattern :D! Really love :D! So great look, love the delicate details. ABSOLUT MY LOOK!!!! Superschön - würde ich genauso tragen! I am loving the leather jacket and your print sweater! One of my fave outfit of yours, Madison. That jacket is seriously bad-a$$! You have good fashion instincts. This outfit rocks. I would never think to pair camouflage with lace but somehow you make it work fabulously Madison! Happy Monday! Madison, you can just hand over that leather jacket girl! I love the way it zips. So awesome! Glad you had a great weekend. There's nothing like family & friends. Awesome layering! It's like sugar (lace) & spice (camouflage). You looked great! Have a great week. Great outfit, You look is so cool! Yea, time really does go by fast when you're having a great time. This is why weekends should be longer. I really do love the panel jacket you're wearing. The detachable zippers are really wonderful. You look stunning babes.I love your leather jacket and pants. I always struggle with layering in the autumn. You've done a great job and your sweater is the cutest. Nice outfit! I like your boots! Wie ich lese, hast du auch gute quality-time mit deinen guten Freunden verbraucht. Es ist Gold wert, gute Freunde zu haben. Dein Outfit mag ich. Der Kontrast mit dem Spitzenrock ist super. I'm so glad you got time to catch up with your friends, that is awesome that you could laugh and have a good time with them on skype or on the phone! You are looking super chic in this outfit btw, love that sweater on you. Love the look, especially the jumper and the skirt! Your lace skirt is absolutely cool! hey, Madison. I'm sorry I haven't visited for awhile. but anyway, let me tell you all this black leather looks beyond fierce on you! such a strong ensemble and such a stunner into the autumn weather. you sure rock the whole thing! Glad you had time to catch up with your friends. You look super cool. Leather and camo are two of my favorites and together a pretty awesome combo. I love everything from head to toe and wish you a happy Tuesday Madison!! I love the detailing on that moto jacket! It gives the outfit edge! Yes, fluffy clouds! I thought the leather trousers suited it for a different look!Thanks for your comment. Ahh, yes to leather any day, haha. Thanks very much Mira. Wishing you a wonderful week so far. Oooh awesome mix of print and texture! Liebe Madison, wie schön, dass Du Deine Freunde in live getroffen hast, und dass Ihr eine so tolle Zeit zusammen hattet! Toll ist auch Dein Look, Du hast wirklich so ein wunderbares Gefühl für Mode. Die Idee die Spitze mit Leder zu tragen sieht sehr gut aus <3 Ich wünsche Dir noch eine tolle Woche! Swoon! This is such a fab look, Madison! I would never think to pair leather boots with leather pants/leggings, but the effect is fierce. Gorgeous!! I think this is one of your best outfits Madison. I love the rock touch, so avant garde! Usually I'm not a fan of camouflage but I love this oversized version! Hi Madison, this outfit is every type of awesome! 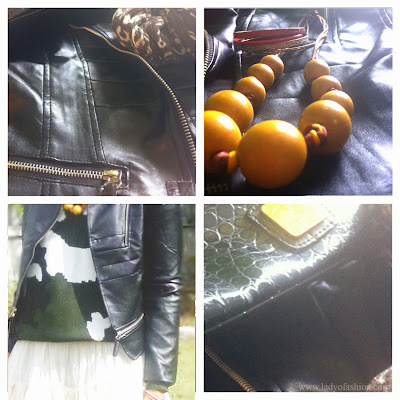 I love your savvy layering, its so interesting and you keep on going back to look at it and find something new to admire! Thanks for your visit...I am currently away and will be back to blogging on Friday. I love all 3 materials together, great outfits! You look amazing. I love the camo top and the leather jacket! So chic. OMG I love this look! Love it! I went to the Lucky Fabb conference today and Adri from Adris World had on a pair of pleather leggings from H&M and they looked so expensive. Love this. Hello dear, would you like to follow each other? Cute outfit Madison, love your camo sweater, it really looks great on you.